While Easter may not be renowned for its delicious home cooked foods the way Thanksgiving and Christmas are, it does come with its own tasty treats. Most of these goodies are of the teeth-rotting-bouncing-off-the-walls-sugar-filled variety but that doesn’t stop most of us from indulging at least a little bit. What’s your favorite Easter candy? Gooey neon-colored marshmallow peeps? Melty caramel or creme filled Cadbury eggs? There’s a lot to choose from. My personal favorite is, without a doubt, Reese’s Peanut Butter Eggs. That thin layer of chocolate containing a mouthful of rich peanut butter…just thinking about it makes me want to rush out to the nearest convenience store and clear the shelves. 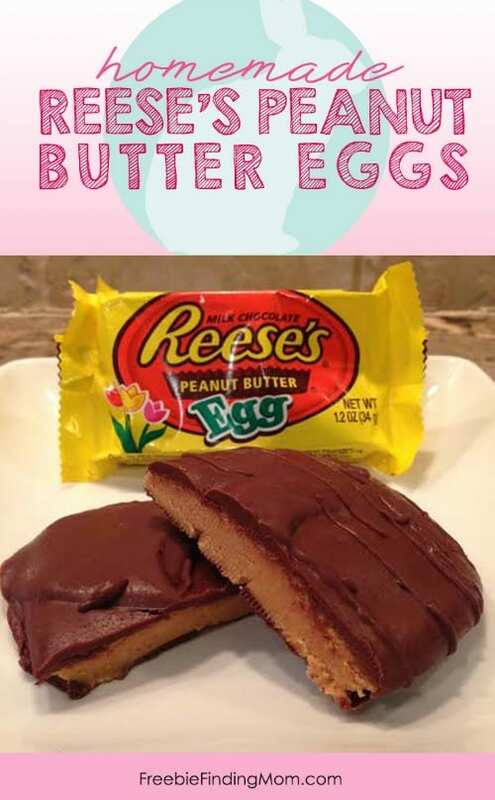 However, this year, instead of purchasing this delightful delicacy, I’ve decided to try to make my own Reese’s style Homemade Peanut Butter Eggs. 1. Line a baking sheet with wax paper or parchment paper, and set to the side. 2. 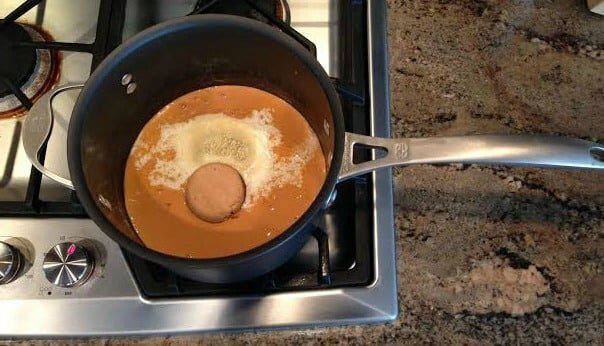 In a medium saucepan, combine the peanut butter, butter, and brown sugar over medium heat. 3. 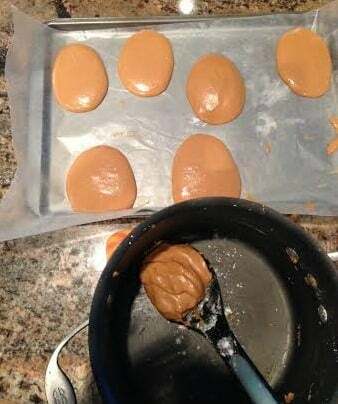 Stirring constantly, heat until the combined peanut butter, butter, and brown sugar are completely melted and starting to bubble. 4. Remove the saucepan from the heat. 5. 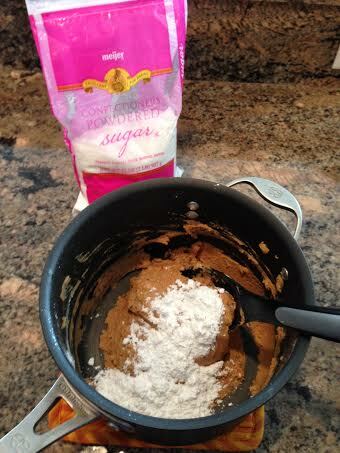 Add the powdered sugar a ¼ of a cup at a time, stirring until completely combined with the peanut butter mixture after each addition. 6. Set the mixture aside and let it cool to room temperature. 7. Using a medium cookie scoop or a heaping tablespoon, scoop out the peanut butter mixture and shape it into an egg. Please note: This is where I deviated from the original recipe. I chose to make larger homemade Reese’s peanut butter eggs. Why you may ask? Because I love them so why not make them bigger? 🙂 I was not nearly as successful at molding my eggs as I would have liked because I had a 2 year old not too pleased with the fact I was making this recipe instead of playing with him. Note to self: Next time practice my DIY skills during nap time. 8. Place the “egg” on the baking sheet and do additional shaping or forming as needed. 9. Repeat steps 7 and 8 until you’ve used up all of the mixture. 10. Place the cookie sheet in the fridge to allow the peanut butter eggs to set. This will take approximately 30 minutes. 11. Once the peanut butter eggs are set, melt the chocolate chips and shortening together in the microwave in 30-second increments, stirring after each, until completely melted. 12. One at a time, dip a peanut butter egg into the chocolate. Tip: Instead of dipping your fingers in the chocolate, use a fork to flip your “egg” over and ensure both sides are completely chocolate covered. 14. Repeat steps 12 and 13 until all of the peanut butter eggs are chocolate covered. Please note: Here again I deviated slightly from the original recipe. Though I did dip the peanut butter eggs in the melted chocolate, I chose to drizzle extra chocolate on top because I liked the appearance. I thought it made the eggs look like they were “decorated” rather than just having a perfectly smooth egg. It is personal preferance of course, you may decide to add festive sprinkles. 15. Return the chocolate-covered peanut butter eggs to the refrigerator to allow the chocolate to set. This will take approximately 30 minutes. 16. Store your homemade Reese’s Peanut Butter Eggs in the refrigerator in an airtight container until ready to serve and enjoy! VoilÃ ! Homemade Reese’s Peanut Butter Eggs just in time for Easter. Well, maybe, I may need to make another batch before Easter. 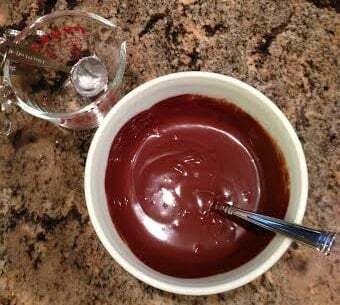 This recipe produces chocolate covered peanut butter eggs that are just as good as those you can purchase at the store – although, depending on your cooking skills, they may not look quite as good. In addition, this recipe for homemade Peanut Butter Eggs isn’t overly difficult to master. Heck, you don’t even have to bake anything. What is your favorite Easter candy? Do you have a homemade recipe for it? If so, share a link or recipe in the comments. Looks so good! Thank you for sharing the recipe with us. How many does a batch make?